These can be dreaded questions for students getting ready to apply to college and those already enrolled. The paradox of college is the expectation that you have charted a clear, unwavering career path — but students preparing for college often face an overwhelming array of major options that can vary by name and emphasis at each college on your search list. And once you’re in college, you’re constantly exposed to new ideas, options and self-awareness that cause you to question each possible career decision. 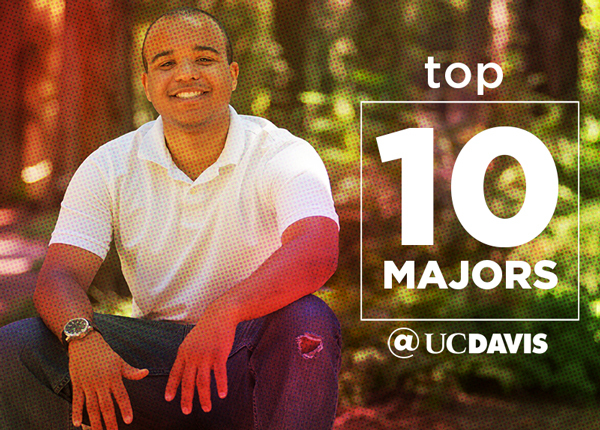 This blog — “What Can I Do With My Major?” — will help you learn about college majors (UC Davis has more than 100 majors) and what kind of careers you can pursue with them. Expect to learn more in this blog about how you can use the Internship and Career Center, a key campus resource for students, to chart your career path. What if you don’t know what you want to do with your major or degree? We’re going to give you solid answers with an action plan. And don’t forget to look for our blog post on top jobs you won’t find on TV or social media. You’ll hear from our alumni about what they did with their major. And, we’ll help you develop the career path you desire by showing how to build out your educational experience and take advantage of programs that add to your resume. Our goal is to help you get the skills, knowledge and confidence for your next step, whether it be a first job in the field you desire or professional and graduate school. In addition, “What Can I Do With My Major?” will offer advice from our human relations expert on what employers are looking for in new graduates. Counselors from Student Health and Counseling Services will offer advice on how to deal with issues you might have such as internal conflicts, family expectations or how to set on a course toward personal fulfillment. It all starts with that issue of choosing your major. The truth is, most of us choose a college major based on limited information. And then that major becomes the degree we earn when we graduate and what we put on our resume. We had exposure to a handful of general disciplines in high school, which we liked and disliked in varying amounts. Doctors, teachers and others we interact with often make their careers seem worth exploring. We also learn about professions through TV, movies and books (we won’t get into the accuracy of these portrayals today, but stay tuned). For most of us, family, friends and neighbors round out our exposure to information on careers. But, the college majors people studied are rarely part of the conversation. So, why all the pressure on selecting a major? It’s shorthand —a brief way to gain insight into your interests, values and aspirations. Choosing a major allows you to begin to focus. For most college graduates, a major does not directly equate to a career. It’s a framework for learning, ideally in a topic area you find interesting. So, why all the pressure on selecting a major? It’s shorthand — a brief way to gain insight into your interests, values and aspirations. Choosing a major allows you to begin to focus. A satisfying career means something different for each individual, but doing what you enjoy is a pretty universal definition. In a best-case scenario, your major helps you develop the skills that you can see yourself using on a daily basis. Internships, research, study abroad and engaging with clubs and student organizations are additional skill builders. Those who tell you, “I never use anything I learned in my major,” likely have not inventoried the skills they developed in the course of their studies. Regardless of your major, a bachelor’s degree helps you develop skills that are transferable to a multitude of professions and environments. Each year the National Association of Colleges and Employers conducts a survey of the skills employers want new college graduates to possess. Leadership, working as part of a team, communication and problem solving (all attainable in any major) top the list – far above technical skills. Part of choosing your major is choosing a university with career-building programs and resources that support your program of study. Students at UC Davis know that our Internship and Career Center is dedicated to helping them graduate with a well-informed plan, based on knowledge of themselves and the wide array of career opportunities they can pursue. We also help students to connect with employers (often alumni) so that they have a realistic view of careers and a professional network of their own. The UC Davis Internship and Career Center has resources to help you connect majors to careers along with other resources to help you choose a major, including part time jobs, internships and information about a wide variety of careers. Our faculty, students, alumni and staff will tell you about specific majors at UC Davis and career outcomes. Expect to see videos and testimonials from students and alumni who talk about how their major has fulfilled their goals — and how they used those skills they learned to take unexpected job avenues in their lifetime. You’ll get ideas about top majors for going to medical school and law school or working in the Silicon Valley. And you’ll read about how alumni with traditional degrees like animal science or biology develop creative jobs outside of what you might expect. We’ll be looking for feedback from you on the blog and how we can improve. Please sign up for our newsletter subscription, found on the blog’s home page, where we will send short emails on a monthly basis about blog posts and — only very occasionally — a survey about how we are doing and what you want to know. This is a conversation, and we want to hear what you have to say. Marcie Kirk Holland is director of the Internship and Career Center. As a first-generation college student with undergraduate majors in environmental conservation and Spanish (with a focus on literature), she is in a position she never would have dreamed of pursuing when she was selecting a college major. Susanne Rockwell is web editor for the UC Davis home pages and this blog in Strategic Communications, helping to tell the story of UC Davis since 1989. An alumna whose husband and daughter also attended UC Davis, Susanne has had to explain what she did with her own major (international relations) to more than one person.